***Disclaimer: Article contains some speculation. Speculation will be colored in PURPLE. If an error is found, please mail me and I will correct it. Grown in isolation for over a thousand years, the Sith Empire had consolidated its strength and flourished into a galactic power that nearly brought the Republic to the brink of defeat in their pursuit for vengeance. Built on the founding principles of the Empire before them, values of strength and efficiency permeated all levels of Imperial society. All the while, a system of subjugation and oppression remained in place to quell those who would dare break the uniformity of the Empire. With the Code of the Sith serving as the nation’s spiritual core, their Order ruled supreme. All citizens were expected to serve with devoted fealty, and their obedience was often well rewarded….. and their failures swiftly punished. Brought into conception in 1327 BTC, the formation of the Reformed Sith Empire was forged from the ashes of their previous incarnation. At the conclusion of the Great Hyperspace War, the Republic, refusing to accept the possibility of a second war, proceeded to hunt the surviving Sith down. Genocide, sponsored by both the Senate and Jedi Council, became their new prerogative. All the while, unbeknownst to the rest of the collapsing Sith Empire, Lord Vitiate used this panic and fear to call the remaining leaders to his home planet for an emergency convention. It is here where he, through the powers of sith sorcery, absorbed the life of the entire planet and all those who were upon it. Now one of the strongest beings in the galaxy, he collected the remaining sith and imperial forces, all of whom were unaware of his previous actions. Acting as a beacon of leadership to the remaining survivors, Vitiate organized a massive exodus into the unknown regions of space. Believing that the Sith had finally been purged from the galaxy, the Republic called off their hunt. All the while, the Exodus Fleet of survivors wandered in the fringes of space for nineteen years. Lord Vitiate had declared himself as the new Emperor, and used this time to inspire loyalty, devotion, and dependence within his followers. At the end of their nearly two decade wandering, the Sith Emperor allowed the Exodus fleet to ‘discover’ Dromund Kaas. Heralding their new Emperor as their savior, imperials and sith alike began to organize the construction of their newfound home. Twelve prominent and loyal Sith were designated by the Emperor to become the first generation of Dark Councilors, whom proceeded to aid in the governance of their fledgling nation. Proactive imperials, such as first Grand Moff Odile Vaiken, began to lay the very foundation of the Sith Empire’s military; which would later go on to dominate half of the known galaxy. As time passed, the Empire began to carefully expand outward while fortifying their military might. Sometime before revealing themselves to the wider galaxy, the Sith Empire became aware of the Chiss Ascendancy. Attracted to the faction by their pragmaticism, absence of moral qualms, and lack of any political entanglements, the Sith Empire initiated their standard first contact protocols. A single message was sent to the Ascendancy: surrender or prepare for war. The chiss responded with a request for a diplomatic summit to discuss terms. The Imperials were dumbfounded by the response, considering all other factions that they had encountered in the past had attempted the latter option. Curious and confused, they agreed to a hearing. While many details of the diplomatic meeting remain a secret to this day, it concluded with the Chiss accepting themselves as a vassal state; allowing them to govern themselves, but promising financial and military aide to the Empire. Through this historical meeting of Chiss and Imperial leaders, the Empire gained their first official ally. Prepared for war, the Empire finally and swiftly struck at the Republic in 28 BTC. Their return took the Republic by shock and awe, and the North-Eastern Territories of the Outer Rim quickly fell under the banner of the Sith. Yet, the Great Galactic War waged on for twenty-eight years as both factions began experiencing drastic drawbacks from the prolonged conflict. The stalemate was brought to a close in 0 ATC as the Sith Empire offered peace with one hand, organizing a diplomatic summit on Alderaan, while the other struck with precision and lethality, sending a fleet to Coruscant while instrumental figures of the Republic were present at the summit. Coruscant’s defenses fell and the planet was sacked. The occupation saw to the destruction of the Jedi Temple, a massacre that claimed the lives of multiple senators, and the execution of the Supreme Chancellor. With the capital held hostage, the Republic was forced to agree to the Imperial-favored terms of the Treaty. The event became known as the "Sacking of Coruscant." The occupation was so catastrophic, the Republic’s entire calendar system was reorganized around the disaster. Even so, the Treaty of Coruscant promoted a relative, but flimsy, peace between the two factions. This period became known as the Cold War, as each began bolstering their defenses and preparing for a secondary conflict. This would last for eleven years, before the tension poured over and the Galactic War was renewed in 11 ATC. 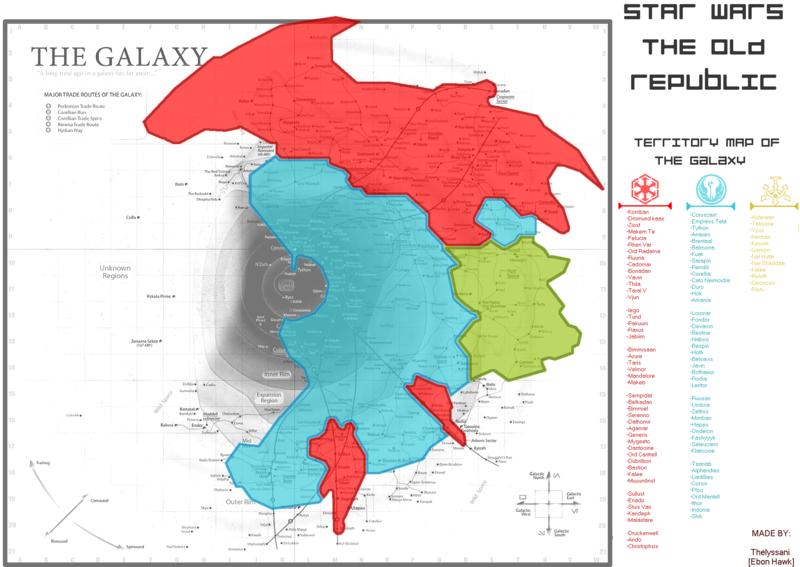 While the Empire originally succeeded in their conquests on Quesh, Taris, Hoth, the destruction of the Republic’s War Trust, and the assassination of Supreme Chancellor Dorian Janarus, they were unable to hold their key offenses in the Core Worlds, such as Balmorra and Corellia. The failed initiative on Corellia resulted in the death of three of their Dark Councilors, and the loss of a significant portion of their armed forces. Two more Dark Councilors had also perished due to political infighting. In retaliation for this defeat, imperial forces were sent to Ilum in an attempt to steal the Republic’s Adegan Crystal supply. However, Darth Malgus betrayed his people, stole the crystals, and attempted to form his own Empire. A joint force of Republic and Imperial troops crushed this uprising, which concluded with the Sith Empire withdraw from the system. These repetitive setbacks forced the Empire to go on the defensive. Malgus’ betrayal also set in motion a radical policy. The Sith Empire passed the Alien Initiatives, which weakened anti-alien policies within the Empire and allowed aliens to finally gain military ranks within their society. While institutional discrimination may of been weakened, many within the upper echelons of imperial society continued to cling to their humanocentric mindset. Morale for the Empire, however, continued to decline with the news that their Emperor had been assassinated by a Jedi Strike force. With Darth Marr becoming the defacto leader, he organizes a covert operation on Makeb. This Operation allowed the Empire to claim the planet for themselves, giving the Sith Empire a burst in technological advancement due to the rare resource Isotope-5. However, it came at the cost of multiple systems. The defensive measures of the Empire were further hampered by internal betrayal. With the news of the Emperor's death, the Dread Masters, a powerful group of sith dedicated to fear, went rogue. They were swiftly dispatched by unified Imperial and Republic forces. Furthermore, Darth Arkous, Councilor of Military Offense, secretly conspired with the Order of Revan, which resulted in Korriban being sacked by Republic forces before being quickly reclaimed. The Order of Revan’s conflict with the Empire came to an end on Yavin 4, where a united Republic and Imperial coalition ended the heretical group. However, the Sith Emperor, whose spirit had been recovering on the planet, was awoken. Abandoning his people, the wayward Emperor restored his strength by consuming all life on Ziost, the Empire’s main economic world. Soon after, a foreign power began attacking both the Republic and the Empire, which resulted in Korriban being sacked a second time. While on an expedition for the disavowed Emperor, Darth Marr was captured and subsequently executed by the Eternal Empire,, an advanced civilization ruled by an avatar of the Sith Emperor, named Valkorian. Due to an internal struggle within the Eternal Empire, Valkorian’s son, Arcann, took the throne and waged a devastating war against the Republic and Sith Empire. Within months, the Imperial capital was blockaded, and most of their navy was rendered inoperable. The Empire fought fiercely, but lost. With most of the Dark Council dead or in hiding, the Ministry of Logistics negotiated their surrender. Darth Acina,, one of the few survivors of the Dark Council, supported the Ministry’s declaration of surrender and claimed loyalty to Emperor Arcann. Soon after, she declared herself the new Empress of the Sith Empire. Arcann publicly acknowledged her claim, and she rose to her newfound seat of power with public support and popularity. Fortunately, the Sith Empire was allowed to keep most of the planets they had conquered in the previous wars since they had not only sworn fealty, but surrendered before the Republic had. Even so, they were still forced to provide heavy tributes that crippled their economy., as well as having to comply with severe military and arms restrictions. However, after multiple years under the oppressive rule of the Eternal Empire, a joint coalition of rebel fighters formed in 21 ATC, known as the Alliance. This faction was able to weaken the Eternal Empire’s hold on the galaxy, which sparked the Sith Empire’s eagerness to fight. Defying their sanctions, the Sith Empire quickly, and secretly, rebuilt and expanded their military. Once the Alliance had gained galactic notoriety in 23 ATC, Empress Acina and her forces joined the fight against the Eternal Empire, now lead by Arcann’s sister, Vaylin. In doing so, she openly offered to be the Alliance’s ally in their fight for liberation. Eventually, the Eternal Empire fell, and the Alliance became the Eternal Alliance. However, the Sith Empire began to once more turn their attention to their historical rivals now that their previous oppressors had been removed. Converging on Iokath, the Republic and Sith Empire wage war over control of the technologically advanced and resource rich planet in a vie for dominance. The Sith Empire is structured into twelve Spheres of Influence, which operate as government branches. These spheres are uniquely geared to manage and govern specific facets of the Empire. Each branch eventually answers to a Dark Councilor, who in turn answers to the Emperor or Empress. Below the Dark Councilors are the Ministers, generally non-force users who had previously served as Moffs, who aide in the administrative aspects of government. The military fell under this Ministry’s purview. The army answered to Imperial High Command and the navy answered to Imperial Fleet Command, both of which were staffed by an administration of moffs and other high ranking military officials. These two organizations then answered to the Minister of War, who headed the department. Surveillance, black operations, information distribution, and other intelligence affairs, both foreign and domestic, all fell under this Ministry’s Purview. Sith Intelligence, formerly Imperial Intelligence, Imperial News Network, and the Outreach Bureau were three of the most well-known agencies underneath the Ministry. Manufacturing, military production, infrastructure, communications maintenance, matters of the treasury, and the management of the imperial economy were all under the purview of the Ministry of Logistics. The Ministry of Logistics also oversaw travel and the administration of slave populations. The Imperial Citizenship Bureau, and the Imperial Treasury Department fell under this Ministry. Designed to oversee, organize, and conduct defensive military actions. This Sphere collaboratively supervises the Ministry of War. Designed to oversee, organize, and conduct offensive military actions. This Sphere collaboratively supervises the Ministry of War. Designed to create strategic plans and provide tactical assessments for the Imperial Military. This Sphere collaboratively supervises the Ministry of War. Designed to oversee the intelligence operations of the Empire. The Ministry of Intelligence answers directly to this Sphere. Designed to oversee the Sith Empire’s economy. The Ministry of Logistics answers directly to this Sphere. Designed to oversee diplomatic affairs of the Sith Empire. Imperial Non-Human Relations and the Imperial Diplomatic Service directly answered to this Sphere. Designed to oversee the medical needs of the Empire. Alien Control and the Imperial Medical Corps answers directly to this Sphere, and the Sphere jointly oversees the Imperial Science Bureau with the Sphere of Technology. Designed to oversee the technological advancement and maintenance of the Sith Empire. The Imperial Corps of Engineers, Imperial Ordinance Acquisition Corp, and the Imperial Power Bureau answer directly to this Sphere. The Sphere jointly oversees the Imperial Science Bureau with the Sphere of Biotic Science. Designed to oversee the Empire’s internal law enforcement and judicial systems. Imperial Corrections and the military police fell under this Sphere’s purview. Designed to protect imperial history and expand the knowledge of the Sith. As such, the Sphere *possibly* oversees the Empire’s educational system. The Imperial Reclamation Service serves the interests of this Sphere. Designed to uphold and enforce the Sith code among the populations of the Empire, sith and denizen alike. This Sphere *likely* worked closely with the Spheres of Laws and Justice and Ancient Knowledge. Designed to protect the secrets of the Empire. This Sphere’s purpose, membership, and inner workings is shrouded in secrecy to most of the Empire’s denizens and Sith. So much so, the only widely known member is the Sphere's serving Dark Councilor. In the shadows of obscurity, the Sphere is actually responsible for the management of assassins who remove threats to the Empire without and within. Among the upper echelons of the Empire, those who know of the Sphere’s true purpose have privately renamed it the “Assassin’s Pyramid.” The Red Legion and the Dread Executioners served this Sphere. This, however, does not mean that there are now only five Spheres. Rather, a Dark Councilor is simply the head of multiple Spheres, and the title of their seat serves as an administrative umbrella term. Ruling with supreme authority, the Sith Order resides at the top of the Empire’s pecking order. Embedded within the twelve Spheres of Influence, all sith are legally obligated to serve the interests of at least one of the twelve branches. Each sphere acts as a structure of power that is to be ascended, with the overarching structure functioning as the personal power-base of whichever Dark Councilor is in charge. Each branch supports its own ladder. Pre-Zakuul, The Head of one of the Twelve Spheres. After the reforms conducted by Empress Acina, the head of one of the five domains that oversee the twelve Spheres. High Tier Rank. The title is granted to only the most exceptional of Sith. High-Mid Tier Rank. The title is granted to well-accomplished Sith. The position of Lord is a difficult rank to achieve. Sith could go their entire career without being granted the prestigious office. Once a sith completes their trails, they are officially a fully fledged sith; nothing more, nothing less. They immediately enter the service of the government and serve under one of the Spheres of Influence. Most sith will remain in this ranking throughout their life. Introductory rank to students of the Sith Empire who are still undergoing basic curriculum. An apprentice is any fully fledged sith who is formally under the tutelage of another sith. This state-recognized relationship is subservient, but educative. Any rank, excluding acolyte, can essentially be an apprentice to a sith that is higher than them within the hierarchy. Within each rank is a nuanced system of seniority, based on accomplishments, race, and time holding the title or position. Thus, it’s entirely common for a Darth to be subordinate to another Darth who holds seniority. EX: when Darth Arctis held the seat of Dark Councilor for Ancient Knowledge, Darth Thanaton was his direct subordinate. Underneath Thanaton was Darth Skotia. Furthermore, the duties and reach of each sith is limited to the Sphere that they serve. EX, in regards to diplomatic affairs, a Darth from Biotic Science could not override the diplomatic commands of another Darth from Expansion and Diplomacy without support from the government. However, in some instances, Sith from other Spheres do overreach and give commands to imperials who are not in their employ. When this occurs, the imperials are often forced to comply or face consequences. However, the Sith who overreached can face serious legal repercussions from the Sphere of Influence that they subverted. Even so, due to the overlap between spheres, there is occasional conflict over jurisdictions. A product of a harsh military culture, the armed forces of the Sith Empire were an exemplary fighting force. The policies of the military were completely based off of the original standards put in place by first Grand Moff Odile Vaiken. The general curriculum of the Empire was specifically geared to prepare their denizens for compulsory service. Even in children, competition was encouraged, personal achievements rewarded, and failure punished. Young imperials were subject to in depth analysis for specific talents before being sent to specialized academies to hone those unique abilities. When adulthood was reached, all denizens were automatically enlisted into the government’s service. While all were expected to undergo basic training, not all citizens would go on to serve the Ministry of War. Rather, they’d simply be obligated to serve one of the twelve branches of government in other capacities, such as logistical officers, analysts, technicians, and scientists. They would still have to demonstrate efficient knowledge in basic weapon use, self defense, first aid, and general survival skills. As such, the military mindset was ingrained in all aspects of society. To advance, one must serve well. Grand Moff Vaiken’s original policies ensured that rank and status cannot be bought with wealth or granted through birthright alone. Only through consistent success may one ascend. This disciplined system and standard upbringing promoted an efficient and well organized military force, as well as imbuing the standard imperial with unfaltering loyalty to the regime and a staunch dedication to the virtues of individual success. "Given the Importance of the military to everyday life in the Empire, understanding the military’s rank structure and hierarchy are second nature to practically every imperial citizen. The different branches of the Imperial military are more closely integrated than those of the Republic military, having been formed and developed concurrently after the Empire’s settlement of Dromund Kaas. This helps facilitate cooperation and joint strategies, giving the Empire its well-earned reputation for precise coordination." "The armies of the Sith Empire are a masterpiece of military ingenuity. Their training is as effective as it is efficient. Their equipment is second to none. But most of all, their dedication to serving the Empire proves that there is more to Imperial society than following the commands of Sith Lords out of fear, as some would argue. These elite soldiers truly believe in the superiority and power of their culture, readily laying down their lives to achieve the Emperor’s Goals. Few Military forces in the galaxy can match the coordination, skill, and aggression of the imperial infantry. Their many victories in battle are a testament to their rigorous training, which uses live-fire exercises in the most brutal environments in the galaxy to transform eager recruits into lethal implements of the Emperor’s will. These crack troops form the vanguard of the Empire’s conquering forces, battling their foes with unmatched precision and ruthless determination." "With colossal dreadnoughts, deadly starfighters, superior numbers, and devastating weaponry, the Imperial navy has won more victories for the Empire than all other forces combined. The mere rumor of Imperial ships approaching a planet has been known to incite panicking and riots, while their arrival elicits surrender more often than resistance. This fearsome reputation is a testament to the discipline and skill of the Empire’s starship crews, as well as the tremendous capabilities of the ships themselves." The Sith Empire operates under a command economy, where the Ministry of Logistics supervises and controls all commercial, monetary, and production needs through strict oversight and the nationalization of corporations. Since all citizens are mandated to work for the Empire, all denizens are appropriately paid. Thus, poverty is purposely relegated onto subjugate [non-citizen] and slave populations. “Efficiency, regulation, and supply are the key duties of the Ministry of Logistics. As the vast Imperial society works to strengthen the Empire, Logistics guarantees the health of its economy and keeps the population well fed and supplied with the tools necessary to serve. Trade routes, mining operations, and agricultural worlds are managed by the ministry. Resources and supplies are also delivered across the galaxy to armed forces, keeping them strong and prepared for battle. To support its far-reaching responsibilities, Logistics manages the non-military transportation system that links imperial space. Civilian shuttles, speeders, and the operation of the Empire’s impressive space stations and galactic trading hubs are all operated by the Ministry of Logistics. The Empire’s nationalized industries are another crucial Logistics responsibility. Factories and mega corporations work under strict Logistics oversight to create the droids, ships, walkers, armor, weaponry, and other technological advancements required by the Empire’s war effort. Rapid production and revolutionary discoveries are rewarded, while schedule slips are firmly corrected by the logistics arm of the Empire, or in severe cases, the Minister himself. When the industries run on time, Imperial commerce thrives. Oriented around a militaristic lifestyle in service to the Sith, the Empire’s culture is focally centered on the accruement of power and prestige, unquestionable patriotism, and a fanatic dedication to law and order; all reinforced through a totalitarian lens of interpretation. While the Empire structures itself as a rigid and uniformed society, the culture is rich in history, lore, and customs. Thus, while some believe that Imperials are simply enslaved to the demands of the Sith, many true-born Imperials holds the ideals and values of their society close to heart, readily willing to lay down their life in service to their home. Above all else, the society of the Sith Empire is constructed around the service of the Sith Order. Believing that the sith are the true rulers of the galaxy, the Empire often view their overbearing masters as vanguards of the imperial initiative and sacred protectors to their very way of life. While fear is a primary motivator, the powers and status of the sith often immediately gain the respect and awe of their devotees. Failure to demonstrate appropriate respect is meant with swift retribution. Possession of Pureblood DNA is an integral aspect to imperial culture. While most original imperials all have an element of Pureblood DNA within their pedigree, only a select few are graced with enough to present the physical features of the Sith race, which is occasionally called by some, such as Lord Abaron, the red markings. Considered a privilege and a blessing, those who are graced with the identifiable genetic markers are generally always force sensitive. Furthermore, the 'red markings' of the Purebloods act as a cultural emblem of heritage and prestige, with many tracking their ancestry into antiquity. Due to their rarity and cultural prominence, ‘Purebloods’ are viewed in the Empire as the Sith Nobility and are considered a privileged cast. Of course, the true purebloods have long been extinct. Even so, none would publically dare point this out as the tradition is deeply embedded in the Sith Empire’s realm of fashion and societal politics. This attention, however, could be considered double-bladed. While demonstrating the physical characteristics of the Sith massively benefit from its presence, they are also held to a higher expectations than their fellow Sith peers. With the Empire’s eyes upon them, ‘Purebloods’ are considered to be the living embodiment of what it means to be sith. Thus, they are socially obligated to meet those standards. In the rare instances that a ‘Pureblood’ is born without force sensitivity, they’re often considered a disgrace by the Sith Order. Many families covertly kill them outright in their infancy, while others allow them to live so that they might serve as any other non-force sensitive would. Ironically, non-force sensitives are still considered superior to non-force using humans, as demonstrated by Executor Krannus. Currently, Sith Purebloods retain a firm grip on their privileged cast, but are starting to feel some pressure from the induction of aliens into the Sith Order. Elaboration on Sith Purebloods by Daniel Erickson, former Creative Director of SWTOR. A neat video on an introductory quest detailing the cultural prominence of the pureblood lineage. While the Twelve Spheres of Influence provide the structural integrity to the government, they also serve as the galactic game board of politics for the Sith Empire. While the Dark Councilors of each Sphere, along with their Ministers, have the final say in how their branch is operated, the political machinations of countless Sith are constantly in play within the hierarchy. The motivations behind these ploys can vary dramatically, but the most general are split between those who operate in the interests of the Empire and those who are simply hoping to ascend the hierarchy of their Sphere. While remaining at the behest of their superiors within the Spheres, many sith hope to ascend up the line of command so that they might improve their influence and overall autonomy. Thus, alliances and political scheming are ever present within the halls of the Sith Sanctum. Generally, political ascension occurs in three common ways. The first is through one’s political connections and social capital. Being well connected can rapidly expedite a Sith’s ascension to power. The second is through individual merit and accomplishments. Actions that go beyond the common call of duty can allow for standard promotions through the ranks. The third is through power-plays; illicit political acts to usurp certain positions. While popular, this method is far more dangerous, and kept out of the public eye. While power plays are to be expected, they are still considered unlawful. When one is caught red handed, or if their plot fails, the consequences can be devastating. Lord Calypho, for example, was arrested, interrogated, and eventually executed for reaching for power he had not yet earned. While sith are held to a different standard than imperials, they still are obligated to comply with their own tiers of laws within the public domain. In privacy, away from the eyes of their devoted masses, the lines dramatically blur. "For the last thousand years the Sith Empire has needed stability and growth more than anything else. That means alliances that prevent power struggles. It means encouraging the creation of more children. Which in turn means marriage and a focus on family. Where once the individual was judged largely alone, bloodlines are now incredibly socially important. A Sith from a long line of powerful Sith will find his path through the Academy easier, his opportunities increased. A family with no Force-users who suddenly find themselves with a Force-sensitive child will sacrifice everything they have to get them martial training and mental discipline coaches – for if that child passes the Academy and becomes Sith the entire family will rocket to the penultimate social class in Imperial society, side by side with moffs and governors, second only to Sith themselves. Marriage among the Sith is usually between only two people and is often to forge a political alliance. Marriages of love do happen often among the lower ranked Sith but decrease the closer the Lord is to the top of the pyramid-shaped power structure. Marriages between Sith and non-Sith are rare as the Sith believe it dilutes the chance of a Force-sensitive offspring. It is a common, though unspoken of practice, for Sith parents to kill a non Force-sensitive offspring and deny it ever existed, claiming the baby was stillborn, etc. A Sith with openly non Force-sensitive offspring is believed to be admitting the thinness of the blood in his or her family line. Adultery is common among the Sith but officially illegal. Divorce is strongly frowned upon but killing one’s spouse for adultery or any other provable offense is socially acceptable. The one time you see obligatory divorce is when a member of the Dark Council breaks a couple apart to stop the assimilation of too much power in one place." "There is no greater contest of wills between sith than the prestigious winner-takes-all competition known as the Kaggath. Most sith spend their lives locked in deadly rivalries with evenly matched foes. They will pit their power bases and resources against each other, sometimes for decades. Sith approaching the end of their natural lives, but who have not yet resolved these conflicts, may declare a Kaggath as a last ditch means of deciding a final victor. Only a sith who is recognized by the Dark Council as possessing sufficient power and authority may declare a Kaggath. Their chosen opponents may be anyone from upstart young Lords to the Emperor himself. The rules of the Kaggath are simple: the challenger defines the battlefield, and the opponent decides the terms of victory. A typical Kaggath is fought upon a single world, but some of the most historic clashes have encompassed several star systems. Sith Lord Tulak Hord’s infamous crusade was fought beyond the furthest edge of the galaxy, where there are no stars or light. Most of these ultimate battles were fought to the death, though humiliation has occasionally been deemed sufficient punishment to settle the score. The only rules a sith must obey once a Kaggath begins is that no one outside each competitor’s personal power base may lend any aid, and the battle must never directly harm the Empire. Dark Council members Darth Victun and Darth Qalar obliterated the Citadel on Dromund Kaas during an especially violent Kaggath. In response, the other Dark Councilors immediately executed them and used their assets to rebuild what had been destroyed. The names Victun and Qalar became epithets within the Empire, and their bloodlines have vanished." "It has always been a privilege to face the trials at the Sith Academy. Even though most acolytes fail - and the cost of failure is typically death - the chance to train in the dark arts and become one of the most powerful beings in the galaxy is incentive enough for most. Others, attuned to the Force but reluctant to participate, are dragged and forced to face the trials. Until recently, only Purebloods and humans from the Empire were allowed entrance. To produce a sith child is one of the Empire's highest honors, and families identify and groom potential candidates from an early age. Since the loss of so many sith in the war, however, a swell of less traditional thinking has opened the Academy to anyone displaying force sensitivity. Some conservative Sith call this a foolish and desperate move that will dilute the order instead of returning it to strength; others accept it as a temporary measure. At first, the conflict was merely intellectual as the first waves of new recruits into the Academy died ingloriously - but things are changing, and the new breed of sith may yet prove itself worthy." Once the planet of Korriban had been retaken during the Great Galactic War, it became the epicenter of training for the newest generations of sith. Serving as the Sith Empire's true birthplace, as well as a tomb for the most prestigious of Dark Lords, the planet is considered to be a holy site by the Empire. Only sith may freely travel to and from the planet. Non-sith must either be stationed or invited by a member of the Sith Order to so much as step foot on the barren planet. Such permission is considered to be a great honor and privileged to those worthy of receiving it. Imperial society is heavily invested in the notion of bringing law and order to the rest of the known galaxy, willing to sacrifice personal freedoms for assured safety and security. Due to the harsh methods of internal policing of both Sith and Citizen alike, as well as the Empire’s extensive surveillance networks, the Sith Empire boasts an impressively low crime rate. The crippling punishments for even minor offenses are often enough to ward off most forms of misconduct. With the Galactic Republic being viewed as a stagnant power, crippled by political corruption and shady corporate interests, many Sith and Imperials are committed to spreading the Empire’s influence in the name of justice and jurisprudence. "Compulsory military service is one of the central tenets of Imperial society. Those who are not Force-sensitive are automatically enlisted as soon as they become adults, and remain in the Empire's service until retirement or when death or disability renders them unable to contribute. There is no advancement through wealth or manipulation and no honor or influence is granted by birth alone - save for those attuned to the force, who then become sith. Those who serve well, advance. Those who fail gain nothing. As a result of their service, the average Imperial citizen is disciplined, dedicated, and highly invested in the success of the Empire. Though not every citizen acts as a frontline soldier or starship crewman, the military mindset is ingrained in every level of society. No one is poor, and no one is idle. Everyone serves." "The sith are, and will always be, the ultimate masters of the Empire. But this does not mean the people born without an affinity to the Force can never advance to the highest echelons of Imperial society. Those who show merit rise above the rest, whether it’s on the battlefield or in determining the most efficient method of transporting supplies. With constant warfare and expansion, there is always room for promotion, and plenty of opportunities to prove one’s worth. Advancement brings with it influence and prestige, with full dynasties emerging as successive generations continue to bring further honors to the family name. Still, no matter how high a family may rise in stature, their children cannot coast on past success. Only continuous outstanding service can ensure that a powerful family will remain at the top tiers of Imperial society. "The Sith Empire would have collapsed milennia ago if its leaders nod not comprehend how to motivate their people with more than just threats and intimidation. Sith Lords are generous to their subjects, showering common citizens with the rich spoilers of conquered worlds. Enslaved populations are parceled out to Imperial households as servants and laborers, ensuring lives of comfort and luxury for their masters. Every equinox on Dromund Kaas heralds an indulgent week-long feast, reminding the people of what they fight for and stand to lose. Vaverone Zare, one of the most beguilingly beautiful Sith Lords in the Empire, is often seen leading decadent parades through the streets of Kaas City, encouraging citizens to join her. Whether people accept her invitations with fear or love is immaterial; what matters is that sith and subjects stand united." The Sith Empire, throughout its history, has promoted and sustained itself as a stratified society. All members reside within a social hierarchy that radically impacts their overall treatment and standing within the Empire. Naturally, Sith reside at the top of this pyramid; both legally and socially. Beneath the Sith Order reside the throngs of loyal citizens who serve diligently. Underneath citizens reside non-citizens: visiting dignitaries, tourists, mercenaries, merchants, etcetera. These individuals are considered subjugates, a caste that ranks them only slightly above the status of a slave within the social and legal systems of the Empire; regardless of the individual's wealth and or status elsewhere. Finally, at the bottom reside the slaves of the Empire. Thus, roughly, the social hierarchy of the Empire is as followed. With the Alien Initiatives, the legal distinction between Human and Alien has significantly diminished in regards to institutional policy and law. Yet, social discrimination and humanocentric ideologies remain strong. Also, while the social status of Purebloods remain culturally prominent, the induction of aliens into the Empire has provided a point of contention between Purebloods and the newest generation of alien Sith. "In contrast with the Republic, which officially condemns the practice, slavery is widely accepted across the Empire. However, instead of slaves being bought and sold merely on an individual basis, the custom has been fully incorporated into the hierarchy of Imperial society. As the lowest caste, slaves perform menial duties and backbreaking labor, and they possess virtually no rights or recourse under the law. The ranks of slaves are typically made up of those who fall outside the traditional Imperial power structure: prisoners of war, criminals, and aliens from conquered worlds. Children of slaves are born into the same caste as their parents, though it is possible for individuals to be elevated should they show strength and ability that would better serve the Empire in a more distinguished role." Reeling from the consecutive setbacks of the Galactic War and the crushing defeat at the hands of the Eternal Empire, the Sith Empire was on the verge of collapse. However, under the renewed leadership of Empress Acina, the Empire has used the last few years to stabilize itself once more. With the Alien Initiatives having been passed over a decade ago, an influx of non-human service members have risen to serve the Empire; a much needed relief to the strained military. With a focus on minimizing infighting, promoting redevelopment, and technological advancements, Empress Acina has maintained her position of power with popular support. With the rise of the Alliance, the Sith Empire quickly, and secretly, rebuilt the bulk of their Navy in preparation for war. All the while, the resource crisis from years of paying exuberant tributes has taken its toll on the Imperial economy; with many fringe colonies having to ration themselves accordingly. While the capitulation to the Eternal Throne was a humiliating defeat, the time it granted the Sith Empire to rebuild and regroup itself served as an unintentional benefit. Furthermore, whereas the Jedi Order was totally crushed after the Conquest of the Eternal Empire, the Sith Order remains a working institution. Dedicated and ready for vengeance, the Sith Empire now stand loyally behind their first mortal leader. The call for war has been answered above Iokath, as Republic and Imperial forces clash once more. "But challenge and tribulation have shaped the Imperial military since its inception. No matter how difficult things may become, the citizens of the Empire will hold on to their duty and carry on the war for revenge against the Republic." "Although the Sith Empire also suffered heavy losses in the war against Zakuul, Darth Acina’s solitary rulership allowed her to direct her government’s resources more efficiently in the aftermath; as a result, the Imperial fleet is now numerically superior to the Republic’s, with superior troop numbers to match. Efforts to integrate non-humans into the military have been unexpectedly successful, further replenishing the Empire’s ranks. Combined with her successful campaign on Iokath, Acina’s hold on the Imperial throne is absolute. The coordination of the Empire’s forces is similarly impressive. Acina’s low tolerance for schemes and betrayal has created an atmosphere where Sith–no longer concerned they’ll be stabbed in the back by rivals--and their commanders are more willing to commit themselves fully to their deployments. If Acina is successful in maintaining this new status quo, her forces will be able to move very aggressively into Republic territories when war breaks out." "Although the Sith Empire also suffered heavy losses in the war against Zakuul, Darth Acina’s solitary rulership allowed her to direct her government’s resources more efficiently in the aftermath; as a result, the Imperial fleet is now numerically superior to the Republic’s, with superior troop numbers to match. Efforts to integrate non-humans into the military have been unexpectedly successful, further replenishing the Empire’s ranks. The loss of Acina on Iokath has not reduced these impressive personnel and warship counts, but it has altered their deployment. Acina’s replacement, Emperor Vowrawn, is well-known as a cheerful and skilled participant in the schemes and treacheries common among high-level Sith. With him in charge, those in positions of power are watching their own backs more than they did under Acina’s rule; as a result, they are moving their forces more conservatively, afraid to overcommit and leave themselves vulnerable. This could provide opportunities to the Republic that might not have existed otherwise." This section is interactive! If you would like to see a specific question answered, please toss me a mail via enjin, and I'll try to answer it in a timely fashion. Though, not all questions submitted to me will be featured on the forums. 1. Under Sith rankings, Changed "Full Sith" To Sith, and edited the description to more appropriately reflect its status. 2. Under Sith rankings, Added Apprentice to Ranks, along with a description. 3. Underneath structure of the Sith Order, removed speculation on the frequency of Sith overreaching past their occupational functionality. 4. Culture and Customs -Changed Red Mark to Blood Purity, and switched out some references of the Red Mark to pureblood genetic indicators; as well as attaching a neat video on a quest relating to pureblood DNA. 5. 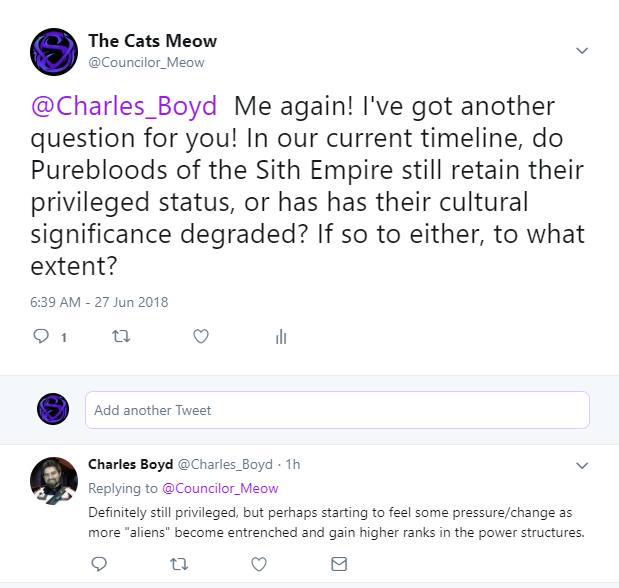 Social Castes - Added some speculation in regards to how the status of Pureblood Sith may be facing contention with the social and policy changes that have faced the Empire, and the rise of a generation of alien sith. 6. Culture and Customs - Law and Order. Fixed a spelling error. Disciple to discipline. 2. 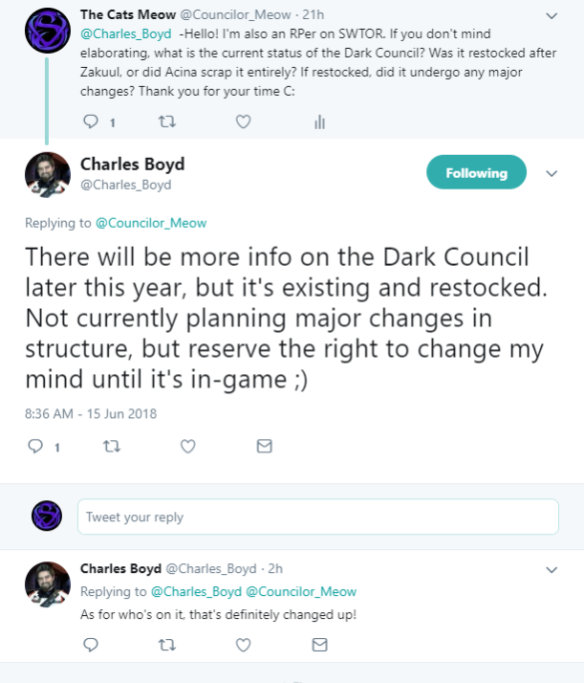 Under Sith Rank and Structure, the speculation of “Minister” was removed with the confirmation of the Dark Council’s existence. 4. Under Blood Purity, formatting edited, speculation colored accordingly, new information regarding Krannus added, and a links to statements from both Daniel Erickson and Charles Boyd. 6. Under Social Castes, removed purple speculation coloring on statement regarding pureblood/alien contention, tweaking the statement to match previous statements by Boyd on Pureblood privilege. 1. Jedi Under Siege updates - Information regarding the reformed Dark Council and the current state of the galaxy has been added.